The great thing about these paper bunny treat bags, they are quick to make cost almost nothing and make an adorable Easter gift. After stitching paper for the first time for my Valentine Map hearts I got the idea to stitch a paper bunny for Easter. Like those Map hearts, the bunnies are very addictive and I ended up making lots of them. I also got to use some fabulous printed papers that I’d saved from a calendar. Decorative papers, I use whatever I can find, craft papers, wrapping paper scraps & wallpaper samples. 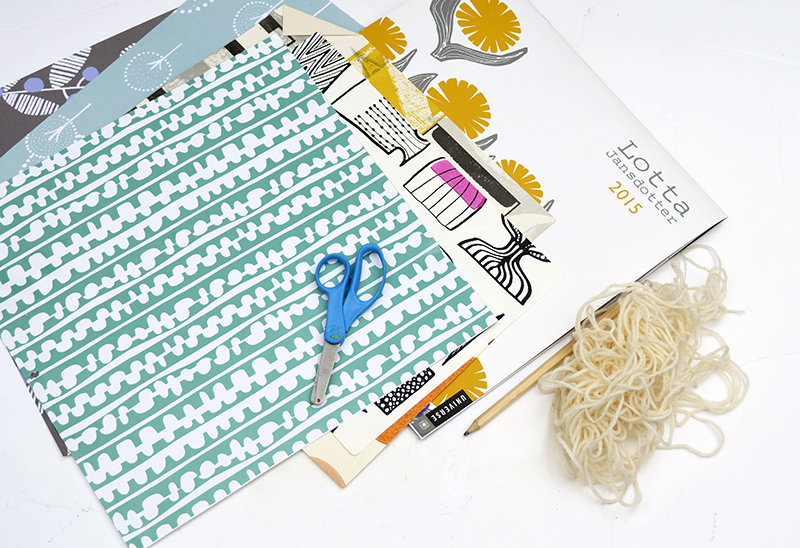 I used an old 2015 Lotta Jansdotter calendar for some of my paper bunnies, as I adore her simple Scandinavian prints. Lots of shops will give you free wallpaper samples, there are so many fantastic wallpaper designs out there. All you need is approximately one A4 size piece of paper for each bunny. Paper bunny template which you can download here. Sewing machine, scissors, needle and thread. Last but not least your Easter treats; I used mini chocolate eggs. 1. 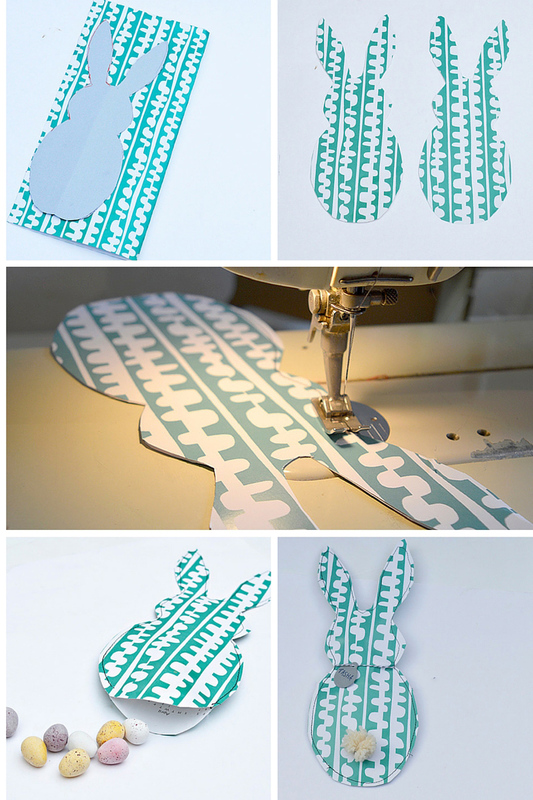 Firstly, download and cut out the paper bunny template or draw your own. 2. Next, once you have decided on the paper you are going to use (should be A4 in size), fold it in half lengthways and draw round your template. 3. Then, cut out your bunny shape. You should end up with 2 identical paper bunnies. Place them wrong sides together and stitch around the edge leaving a gap at the bottom. Use a sewing machine for this. 4. Fill with your Easter treats through the gap and then sew it up to close. A quick way to make pom pom tails. You probably know how to make pom pom’s, but just in case you don’t I’ll show you my quick way to make lots of pom poms at once. All you need is a metal coat hanger, wool and scissors. 1. First, squash your coat hanger into a more rectangular shape. 2. Secondly, wind your wool around the coat hanger at least 20 times. The more wool winds the bushier the pom poms. 3. Using a piece of wool tie round the wool strands at even spaces along the length of wool. These will be the middle of your pom poms. The more bits of wool you tie the more pom poms you will make but the smaller they will be. This is easier to visualise by looking at the picture below. 4. Finally, cut the wool in between these tied middle pieces and cut the wool off the end of the coat hangers. To finish fluff up and trim your pom poms as desired. 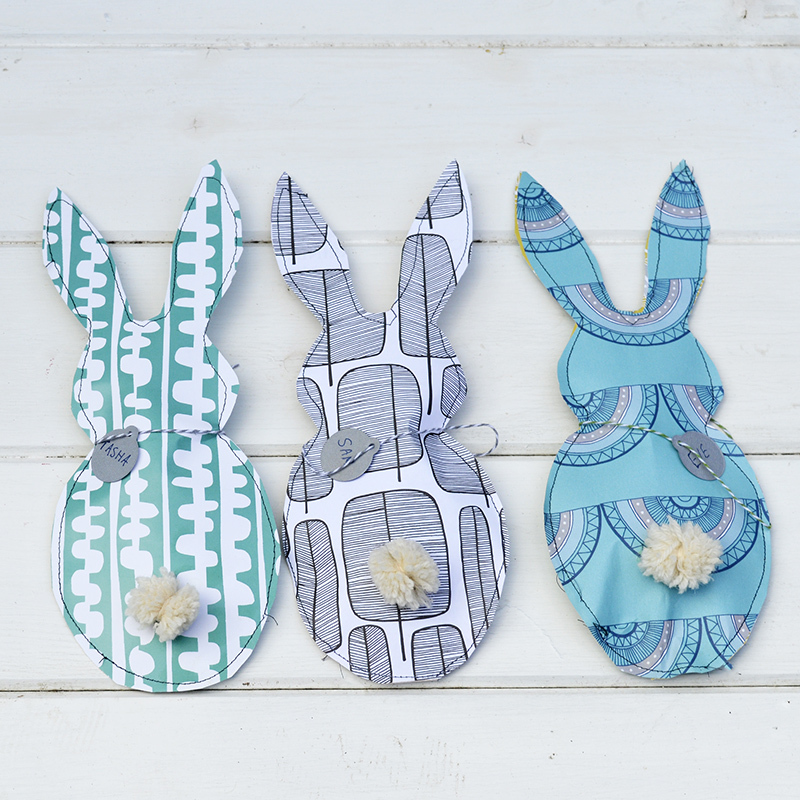 Stick a pom pom to each paper bunny treat bag. 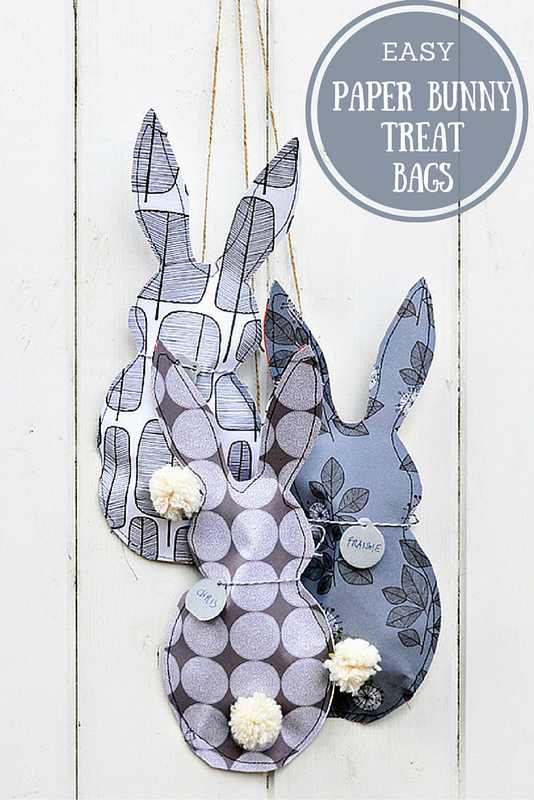 These paper bunny bags are not only great for giving out treats with at Easter but I think they will make great party favours as well. 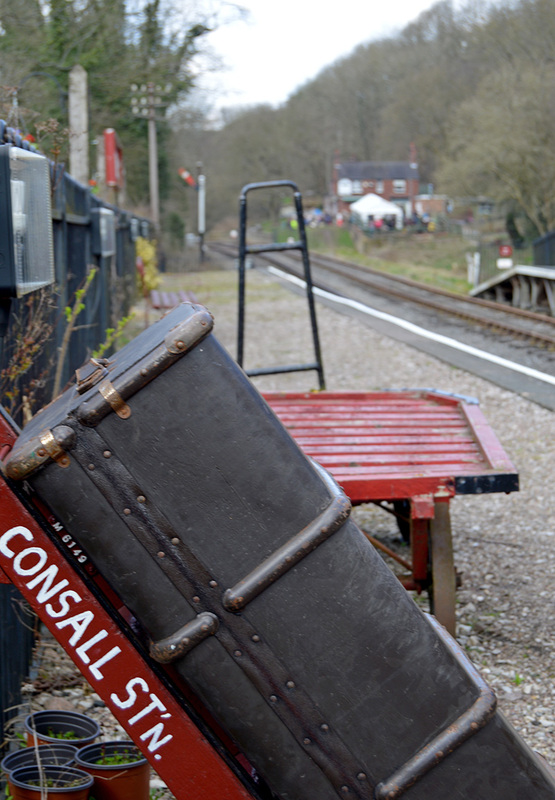 We are actually going to spend Easter in a beautiful part of the English countryside the Consall Valley. My nephews who made the patchwork fabric eggs will be there as well, so I’m going to take these paper bunny bags with me. They are just perfect for an Easter egg hunt. If you like these paper bunnies you might want to check out some of my other Easter crafts. I love this project! So cute and clever! Pinned and sharing. I have chosen this post as my feature for the next Family Joy Blog Link-Up Party. I hope you will join our next party starting Sunday at noon EST. Thank you so much I look forward to seeing the feature. Sewing paper is not new to me but making bunny bags certainly is. I have and Easter egg hunt at my home every year. This might just become a new tradition in our home. Making pom poms like you did is a new lesson. I wish I new this when I was making them for cheerleading when I was younger. Thanks for sharing with TADA this week. See you Thursday! Thank you so much! I will be visiting TaDa later. 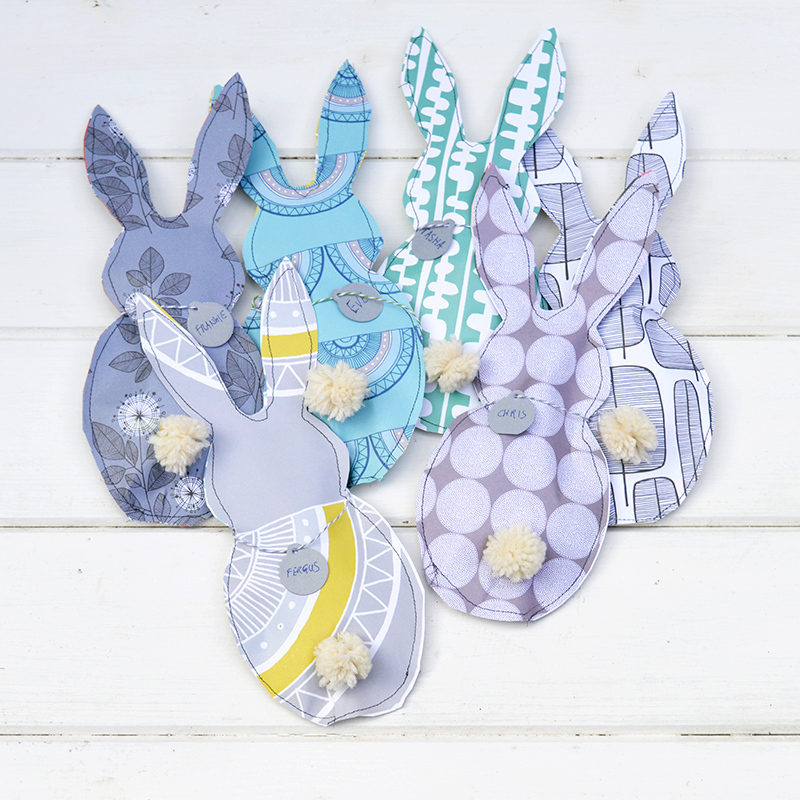 These are super adorable and just perfect for spring and Easter Claire. You always come up with the best and most fun ideas. Thank you, Mary. My nephews love them too, they are great for Easter hunts. I remember your valentine bags, these are even cuter I have to say. I love the place where you are going to have your hunt! Thanks for joining TADA! this week. Thank you, Debbie. 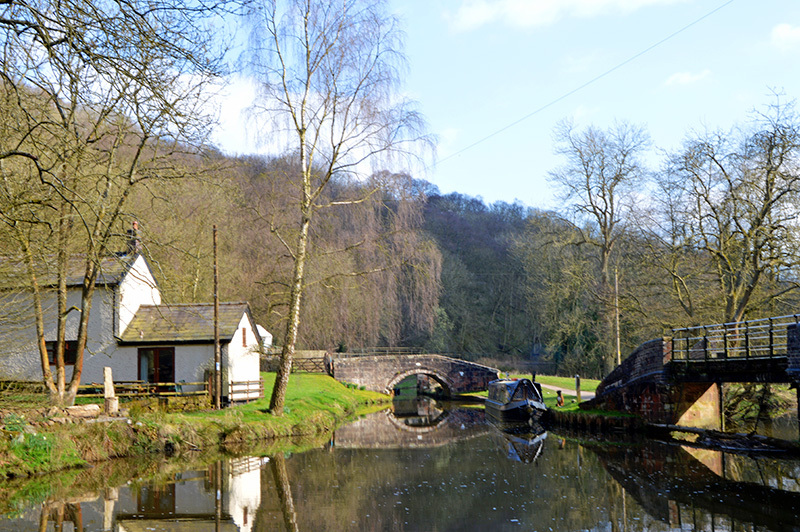 I do like the English countryside. Thank you for sharing your adorable bunnies @Vintage Charm! Very cute! I came over from Happiness is Homemade. I would love it if you post you link at my link party as well. Thank you and thanks for the invite, I have linked up. These are really adorable. You could use them as gifts or hang them as decor and surprise children that they are candy filled later. Thank you! Yes that’s the idea. These are so adorable! And thank you for showing how to make the pompoms, I was thinking I’d have to buy them! Thanks for sharing on the Waste Less Wednesday Blog Hop! Thanks, pom poms are really easy to make especially with my quick method. Thank you, they can be both! These are so stinkin cute. Thanks for sharing your idea. Beautiful bunnies! I fell in love with these them the minute I saw them, and I especially appreciate the tip you shared on how to make several bunny”butts” at the same time. Pinning! Thank you so much! I can’t resist a pom pom. These are so cute, and I am loving your quick multi pom pom making idea too. Thank you, yes it’s a really quick way to make lots of PomPoms in one go. Thank you! The Pom Pom method is really handy. 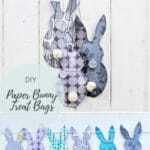 Very cute and your tip for creating a bunch of bunny tails at one time is so clever! Thank you for sharing at the Celebrate Your Story Link Up Party. Thank you so much! That Pom Pom method is so handy. Merry Monday Link Party #96 - More Spring! These are so adorable! Pinned. Thank you for sharing at Merry Monday! These are just the sweetest little creations. Love the pom-pom bunny tails! Thanks so much for sharing your idea and tutorial with Talk of the Town. These are the cutest treat bags I’ve seen in a long time! Thanks for sharing them at Celebrate Your Story link party and we hope to see you there again soon. Thank you very much ! & I’ll be back. These are adorable! Pinned them and hoping to sew some up this week. Thanks for sharing at the talk of the town link party! Thank you very much! Have fun making them. Thank you very much ! That’s really nice to hear that you like my stuff. Such cute bunnies! Pretty paper! Thanks so much for sharing at Submarine Sunday!!! These are so sweet and fun Claire. I love them! Thanks so much for sharing these at Vintage Charm. Thank you ! Glad you liked them. Thank you ! Pleased you liked them. What a great idea! You are right that sewing paper is really easy we do it all the time to make our own books ;). I love the small pom-poms and your method for making them that is genius. Thank you for linking to your fabric egg project, I have been looking for an Easter project to do with the children we had a go at blowing eggs but we did not end up with one whole egg! I am going on a hunt for crafting eggs of some sort this week, I have loads of fabric and mod podge already looking forward to it! Thank you ! Glad you liked them, and the egg craft is a great one to do with kids. Really adorable Claire, just thinking how sad it is to actually have to tear them open! Love those Lotta patterns too…..thanks for sharing on craft schooling Sunday! Thank you! I know about tearing them open, but they are so quick and easy to make you can make 2 lots one to give away and one for decoration. Thank you! Yes the Pom Pom hanger is really handy I use it all the time. I am freaking in love with these bunnies! I think I’ll make some for my front door and maybe even some gifts. Wouldn’t these be cute made from book pages for my book club friends? Thank you ! The book idea sounds great for your friends. How sweet and wonderful for Easter Claire. This looks like such a fun project for adults as well as children to accomplish. 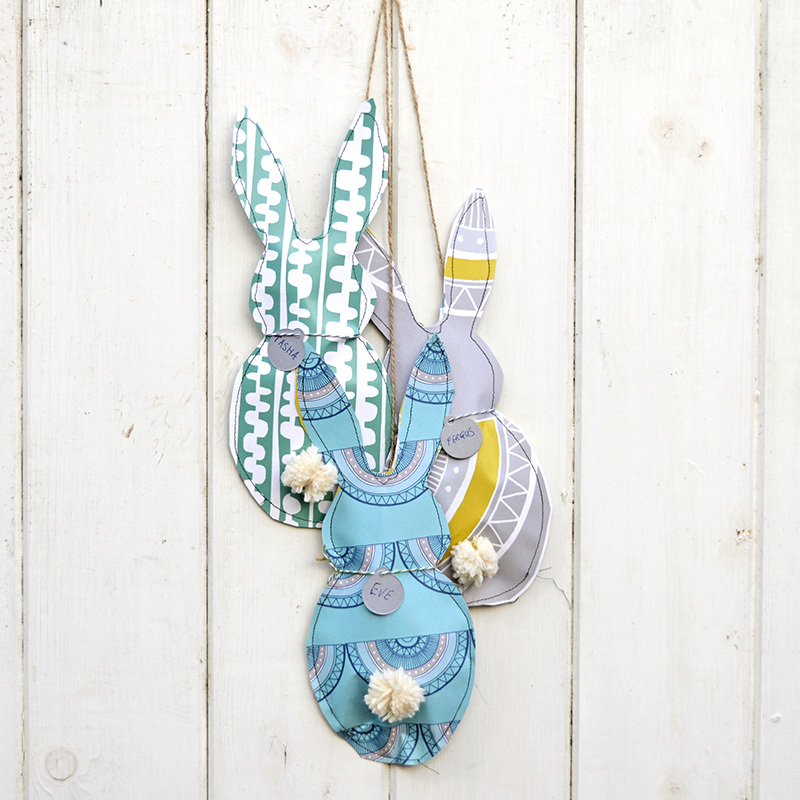 Bunnies can be used in several ways to decorate, gotta love that. I happen to have template very much like yours so will use that. Don’t have printer will work with windows 10 now so trying to manage best I can til I get one. Receiving new printer to go with new laptop as soon as printer can be ordered. Just little bump in road for now and printers worth a darn aren’t being given away on street corners so will have to wait a bit yet .Good for my character to have to wait, learn some patience. So enjoyed this lovely Easter project you shared. Glad to have clicked on your post via blog party. Have always found such delightful blogs that way. Have wonderful weekend. Thank you so much! Hope you get your printer situation sorted out soon. You don’t really need a printer for this the bunny template is simple enough to draw. Super cute! I’ve never attempted sewing paper but you’ve inspired me. Probably more durable than glue! Visiting from Pinbellish party. Thank you ! Sewing paper is easy and fun. These are so adorable. I love the papers you chose. I have never sewn paper (I don’t sew much) but these make me want to give it a try. Saw your link on This is How We Roll. Thank you ! Sewing paper is so easy in fact I think it’s easier than sewing fabric, you should give it ago. These are adorable! What a great idea. I love the decorative paper that you used. Thank you ! I just used an old calendar and wallpaper samples.